It’s December 24. Like every Apple fan out there, we’d all like to get a great, cool and new Apple product. Tell you what… it’s not happening this year, unless the Christmas Fairy is extra generous and surprises me. More than likely not. #10: Apple iPod Classic – Well no one is going to get a brand new Apple iPod Classic this year from Apple or most retailers. Reason? Apple discontinued the venerable little MP3 music player this past fall. Luckily for me I could see this coming and I actually did buy a 160GB model, brand new this past June. So yes, Christmas came early. #9 Apple MacPro computer – Yes, everyone would love to get an overpriced and overpowered Mac. If I were like making the next Star Wars movie or something, I’d probably have at least one or many like these. Frankly, it’s nice to have but I don’t really need one. The MacPro is the same circular tower that was introduced late last year. It screams. #8 Apple iPhone 6, 6-Plus, whatever. Actually I don’t need one and its high monthly bill and locked in two-year contract. Never owned an iPhone and don’t intend to get one anytime soon. Surely it is a nice device running Apple’s latest iOS 8x. It does ApplePay and all of that fancy stuff including being a telephone. #7 Apple Pay – I don’t have any device that supports that. So for now I will continue using old fashioned credit cards and untraceable cash. #6 Apple iOS8 – Well you can get this free with the purchase of any new iOS device – Apple iPhone, iPad and iPod Touch all come with this. You can also get this free if you own an iOS device that supports it. Sadly, my 4-year old, 4th generation iPod Touch doesn’t support any Apple iOS system higher than 6x. I’m out of the loop. #5 Apple OSX 10.10.x – Yosemite – Yes, my two MacBook Pros can both support this latest update to Apple’s OSX operating system. It’s free. But guess what? I haven’t bothered downloading it yet. In fact my 15 inch MacBook Pro is still staying with Snow Leopard which was what – OSX 10.6.8. A few years ago I actually bought Mountain Lion which is OSX 10.8.5. It runs on on my smaller MacBook Pro real nice. I’m happy with it. Haven’t found any reason to update. Surely I can update to OSX 10.9.x – Mavericks. I have that. It was free. Just haven’t installed it. On another note the main reason why I haven’t upgraded to Yosemite is because of all the bad things I heard about iTunes 12x. It does not support the vertical sidebar on the left, which I have used for many years since iTunes 2 or whatever to build many custom playlists. I love playlists. I love easy access to them. iTunes got screwed up after I upgraded to version 11. I think 10.7 was the best but I could not easily downgrade to that after I installed 11x. Sad. Apple has ruined their OSX music player software. So for now I will not upgrade to Yosemite until perhaps I buy a new Mac, like maybe next year or 2016. #4 Apple iPod Touch – If Apple comes out with version 6 of this thing I may think of buying one. But that won’t happen this year. Or even next. No one knows. However if Apple does release an iPod Touch 6 I hope it supports ApplePay as well as be backwards compatible to OSX 10.6.x. What I love about the iPod Touch is that it is just like the iPhone except it does’t have a phone nor the high monthly bill for cellular service. #3 Apple iPads of all Types – A tablet computer is one of those “nice to have” things in life, but frankly I don’t feel a compelling need to own one, much less any iPad that is currently out. All of Apple’s iPads are nice computers. If you have one, I share in your happiness. I’d definitely get the latest and greatest, the MacBook Pro with Retina Display. It is a beautiful computer with a beautiful screen and packed with most of the latest features. What’s not to like? Oh, that. It doesn’t have built in ethernet or a DVD optical drive. I feel more secure connected to a wired ethernet. There is a workaround if you go through the Thunderbolt port. Not very practical if you want to also connect a Thunderbolt monitor. The DVD thing, I can live without but would be nice to have an internal one like most of my previous Mac laptops. However this Mac is plenty fast, up tp 3.7 ghz depending on which model option you select. Plus all models come with onboard flash memory storage options. Nice. #1 Apple iMac with 5K Retina Display – Never have been a big fan of the all in one iMac computers. This one however is a stunner. Comes standard with a 27 inch 5K Retina display monitor (built in), standard hybrid fusion drive up to 1TB in size or the option to get an SSD flash drive up to 1TB (I’d go with the SSD). Prices start at $2499 and can easily climb to the low end tiers of owning a MacPro desktop computer. This iMac also comes with built in ethernet which has been a standard for iMacs for many years now. I hope they continue with this option. 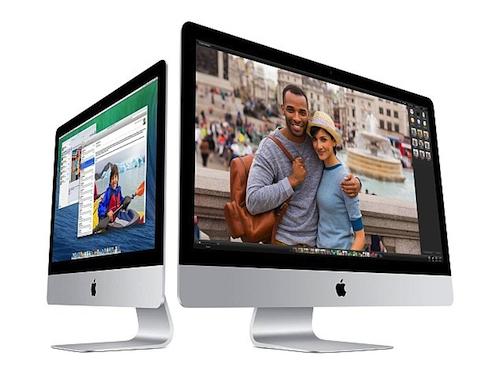 You can read more about the 5K iMac at the link provided above. This all said, here’s wishing you all a safe and happy holiday season. Merry Christmas and a Happy New Year. * Links to Apple’s website may go out of date without notice. I now consider myself lucky to have bought an iPod Classic this past summer. With the discontinuation of the iPod Classic, prices for new, unopened iPod Classics in the used market have skyrocketed. I regularly use mine and it is not for sale. Onwards to 40,000 songs! This entry was posted in Apple, Commentary, Computers, iMac, iOS, iPad, iPhone, iPod, iTunes, Mac OSX, MacBook Pro, MacPro and tagged Apple, commentary, computer, iMac, iPad, iPhone, iPod, iPod Touch, iTunes, laptop, MacBook Pro, Macintosh. Bookmark the permalink.